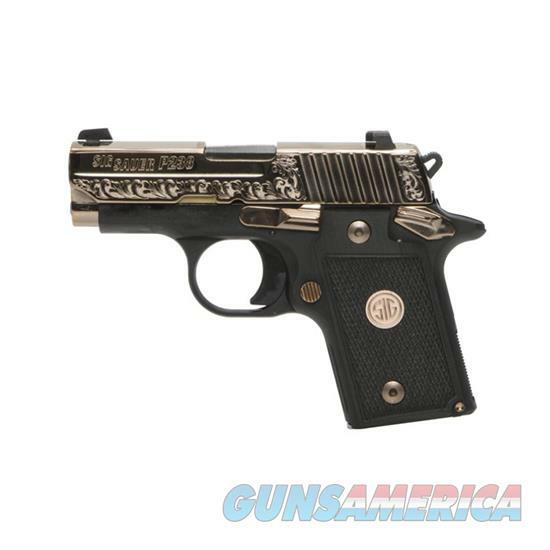 Description: SIG SAUER's original micro-compact carry pistol is featured with an ornate polished and engraved Rose Gold Slide. This P238 has custom G-10 Grips with a Rose Gold Medallion in the middle. Single-action. Incredibly easy to carry concealed this pistol also features SIGLITE Night Sights. It comes with one 6-round and one 7-round magazine. - CALIBER: 380 Auto - ACTION TYPE: Semi-Auto - SIGHTS: SIGLITE Night Sights - SIGHT RADIUS: 3.8 in (97 mm) - FRAME SIZE: Micro-Compact - GRIP TYPE: G-10 with Rose Gold Medallion - FRAME FINISH: Hard Coat - FRAME MATERIAL: Alloy - SLIDE FINISH: Rose Gold PVD - SLIDE MATERIAL: Stainless Steel - BARREL MATERIAL: Carbon Steel - TRIGGER: SAO - TRIGGER TYPE: Standard - TRIGGER PULL SA: 7.5 lb (34 N) - BARREL LENGTH: 2.7 in (69 mm) - OVERALL LENGTH: 5.5 in (140 mm) - OVERALL WIDTH: 1.1 in (28 mm) - HEIGHT: 3.9 in (100 mm) - WEIGHT: 15.2 oz (431 g)***Please allow up to 5 days handling time for this particular firearm.